In the years since Dr. George Kramer began practicing acupuncture, he became concerned with what to do for patients between visits. With acupressure, he could often relieve headaches, neck and back pain by placing individual ear acupressure beads on appropriate pressure points for home use between visits. These beads would only last a few days before they had to be re-applied by a professional. Due to the inconvenience and cost of an office visit, patients would often have to use other means to control symptoms between appointments. So Dr. Kramer conceived of a system where patients themselves could easily apply the acupressure beads at home between appointments. Joined by Dr. Frederick Strobl, a neurologist and co-founder of CNS, Inc. (manufacturer of Breathe Right nasal strips), the two doctors and a team of acupuncturists created AcuBead Acupressure strips. AcuBead Acupressure strips are a group of products developed to provide effective acupressure treatments to patients. This makes the application of acupressure easy for patients and professionals alike. AcuBead products use auricular acupressure to yield significant health benefits for patients that can be used alone or can enhance treatments by acupuncturists, chiropractors, massage/shiatsu therapists, medical doctors and other health professionals. There are four products currently developed: (In addition, further AcuBead acupressure strips are in development for other conditions). 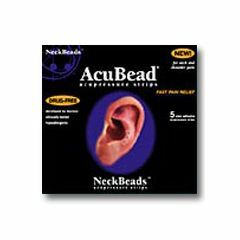 AcuBead NeckBeads Acupressure Strips stimulate areas on the cartilage ridge (antihelix) associated with neck auriculotherapy points. These points are used by acupuncturists for relieving neck pain. There is one strip that comes in the pack. It contains five individual adhesives.